When David did battle with Goliath, he used the leverage of his slingshot to overcome overwhelming odds. In much the same way we, as Blue Collar Investors, must use every tool available to us to level the playing field with the market makers and specialists who are taking the other side of our trades. One such resource is the Show or Fill Rule compliments of the SEC. The brokerages that serve as market makers are NOT going to highlight this regulation and encourage us to use it. That would be like Goliath handing David an article from Technology Today (I just made that up) describing the latest slingshot with a laser scope. So instead, we’ll just have to discuss it in this article. Also called the Limit Order Display Rule or technically the Exchange Act Rule 11Ac1-4. This regulation requires the market makers to show or publish any order that improves the current bid or ask prices unless it is filled. Any order between the current bid-ask spread will improve the market. Most exchanges have a policy in place that requires market makers to fill AT LEAST 10 contracts at the quoted price. For many equities and ETFs the number of contracts required is a lot more and varies from security to security. These players want to buy securities at the lowest price (bid) and sell at the highest price (ask or offer). Now it’s time for Blue Collar Investors all over the world to become annoying and take out our slingshots. As long as the bid-ask spread isn’t too tight or close together, we place our order between the two quoted prices. If the market maker (MM) does not fill the order, he will be required to publish it and then be obligated to fill at least 10 contracts, perhaps more, at that price. Since most of us are selling small numbers of contracts, let’s say up to 5 per stock, in most cases, it is in the best interest of our friends on the other side to just fill our orders and settle for a lower amount on 5 contracts rather than be obligated for twice that amount. We got them right between the eyes….I mean between the bid-ask spread. In this hypothetical the bid is $2.50 and the ask is $3.00. That’s a spread we can work with. As covered call writers, we sell at the bid or in this case, $2.50 per share or $250 per contract. That’s the price the MM wants to buy our options. Instead our offer will be $2.65. That betters the current published offer of $3.00. Therefore, our friend on the other side has a dilemma: Do I fill these 5 contracts @ $2.65 or publish the new, improved offer and be responsible to fill 10 or more as required by the Show or Fill Rule? In most cases, we will get our $0.15 and the MM will get rid of us. This little maneuver will pay for our commisssions and buy us lunch at Wendy’s. $75 becomes hundreds, becomes thousands, becomes tens of thousands and so on. The MMs? They’re gazillionaires anyway…they’ll be alright. For most of us this is redundant, not necessary because the MM is required to fill at least 10 contracts. If this box IS checked the MM is no longer required to publish our offer. Blue Collar Investors have certain tools available that will level the playing field with the MMs. Taking advantage of the Show or Fill Rule is an important one especially when selling a small number of contracts. Although each trade will generate small amounts of cash, over time this will add up to significant dollars that will help to secure our financial future. Unlike David, though, we are not looking to injure our adversaries, just annoy them. U. S. factory orders rose 1.1% in November, a great sign for our economy. Nonfarm payrolls lost 85,00 jobs leaving the unemployment rate @ 10%, a negative for the recovery. For the week, the S&P 500 was up 2.7%, a nice start to the new year. Excellent info here Alan. Good to have a tool to get those extra few dollars – great to cover the commissions at least. You’re right, overtime it could add up. Keep up the good work. Recently this stock has taken a technical breather as it dipped slightly below its short-term moving average. This equity has been an excellent candidate for cc writing the past few months and is worth keeping an eye on as the technicals improve. It is near its 52-week high and recently had a blow out 3rd quarter ER where sales were up 42% and net profit up 59%. It was the 4th consecutive positive earnings surprise. It does have a high PE ratio of 40 but boasts a ROE of 26% and a net profit margin of 32%. I view the chart consolidating and will consider an entry into this one if the technicals strengthen. GOL is on IBD list again – Do i have the calculations right? thanks. I didn’t run the technicals but wanted to confirm if i am calculating the return properly. appreciate the feedback. Others are welcomed. Which chart shows the stock being overbought? Have you seen a new proposal in congress? The Ellman calculator is set up to give these results but it’s always a good idea to understand where they came from. The best place to determine “overbought” is from the stochastic oscillator. Set up your chart as described in figure 28 on page 85 of “Cashing in on Covered Calls” and look for the oscillator to be above the 80% to be technically overbought. This does not mean we must dump our stock but keep an eye out for a single or double dip below this mark for a bearish signal. Stocks can remain in this area for long periods of time as the chart shows. Also, when we view a stock chart we look at the entire picture not one single parameter. Looks like MED took a bashing today, over 14%. Alan, anyone, know what could have caused this? Usually when great companies take a one day hit like these did today, it is unexpected negative news. In these cases, one was market specific and the other company specific. MELI was hit due to the devaluation of the Venezualan currency….nothing we could do to predict with that one. 100 shares @ $50 will become 200 shares @ $25 for a 2-for-1 split. Refer to chapter 17 of “Cashing in on Covered Calls” for a blue collar explanation as to how this works. I went ahead and rolled down from the MELI 50 strike to the 45. I may still be able to squeeze out a small profit on this one. Over the weekend, a so-called Fraud review website claimed that Medifast is a “multi-level marketing scheme.” I’m not sure if there is anything to this. Many well known companies use multi-level as their distribution mechanism. This, in itself, is no big deal. MEd has had strong institutional support, so I’m still holding at this point…but ready to pull the trigger if there are other shoes to drop. I’m down about 48.00 per share…so this hurts. With the BCI methodology, we can work with just about any situation…except…negative news. That was $8.00 per share…not $48/share…the shift key was sticky! As of 10:00 AM, MED has turned around!. The stock is yp over $1.00. The Board of Directors issued a press reelease to refute the allegations against its’ marketing approach of one of MED’s divisions…and…placed a formal complaint with the SEC. I couldn’t find “hope as a strategy” in Alan’s books…but I still hope that the downturn in MED is only temporary. OWINGS MILLS, Md., Jan. 12 /PRNewswire-FirstCall/ — An Independent Committee composed of distinguished members of the Board of Directors of Medifast, Inc. (NYSE: MED) was constituted in February, 2009 to review public allegations of a third party, convicted felon Barry Minkow, and his network of alleged independent experts, posted on Minkow’s website alleging illegal activities of Take Shape For Life, Inc., a direct selling company and a subsidiary of Medifast, Inc. The independent Directors’ Committee, after investigation of facts and information concluded the allegations were false, misleading, and/or without merit. The same is true for the re-issue of the report posted January 8, 2010 – the allegations are false, misleading, and/or without merit. The company has made a formal complaint to the United States Securities and Exchange Commission and the Maryland Securities Commissioner. I’ve noticed a tendency for the market to decline sometime during expiration week and to rise the week after. This does not always happen but in a cursory review of several stocks with options this seems to be the case. Could the Market Makers be doing this on purpose? I’ve considered how to take advantage of this aberation, or at least how to not lose $ when it happens. If you buy the option back, you may have to pay too much to make the play work, especially if your ROI is not that much in the first place. It seems to me the thing to do is to close the option on Expiration Friday and wait to sell the stock when it goes up the following week. Of course there is no guarantee it will go up. It appears we have that scenario as we speak. Wanted to run this by you and see what your thoughts were on this. With the information that Barry has generously shared with us, it makes one wonder whether this sell off of the “stock of the decade” was totally baseless. If that, in fact, is our conclusion, there must be a rule in place to account for this. Well, I have to admit that there currently is not such a rule in the Blue Collar system. Drawn from the concept of “jury nullification” where we “acquit” the stock despite the weight of technical evidence against it. It can be used when we can definitively associate the technical breakdown to an event that we feel has no merit and will soon be recognized as such. IF this is the conclusion one comes to, MED can be retained in the portfolio and sale of the February contract can generate between 4-5% as the stock works it’s way back to the $30 price level. Technical nullification is NOT an official Blue Collar term yet as it just came to my mind as I read Barry’s post. I will give it consideration and welcome your feedback as well. It seems to me that there is a common sense place for it in our arsenal. I have heard of this “tax” on trading before. It seems to be anti-small investor and makes no sense as the government tries to work it’s way past the recession of 2008. I would be surprised to see this pass in its current format, but monitoring the situation does seem prudent. Thanks for sharing this informtion with our group. In your hypothetical, a stock is declining during the final week of the contract. If this is the case, we probably will not need to close the option position as the contract will not be assigned if share price is below the strike. Allow the option to expire worthless and sell the option during the following week or two. If the price is above the strike, you will need to buy back the option to retain the stock. My preference would be to immediately sell the next month option because we are selling an I-T-M strike if rolling out and getting intrinsic value and downside protection….if the deal is in place, grab it! If you decide to roll out and up, you will automatically take advantage of a potentially appreciating stock. The market movement you are noticing may be what’s called “pinning the strike”. This is the tendancy for a stock’s price to close near the strike price of heavily traded options. It has to do with market makers hedging their positions as expiration Friday approaches. Recently declared an industry-leading dividend of 0.70 %. The 3rd quarter ER was positive as this stock is near a 52-week high. SNI has outperformed the market by 50% over the past year. Check to see if this equity has a place on your watchlist. Sure liked the looks of SNI, this morning. A winner, probably, but I plan to start AFTER the Q4 ER due in early February. See, had I not read your books that would not have occurred to me. But what do you think of buying the underlying right away, but writing the call later on, perhaps after some appreciation? Looking forward to the premium membership service. 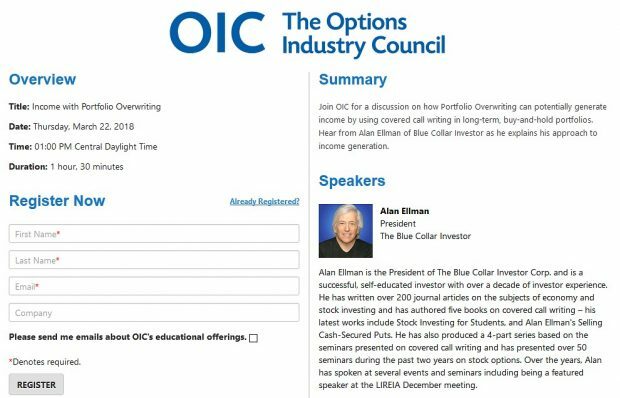 Do you have an update on the Elite Ellman Option Calculator? By the way, I used your blog article from a few weeks ago on the combination order form to unwind my GMCR position. Here are the details below. Thanks Alan! Congratualtions on a good trade. Is the advantage to this early close to reinvest the proceeds immediately, rather that just sit tight to garner the slightly better 2.76 profit when called out over the weekend? I generally do NOT do this. ERs can damage a stock’s value even if it is a positive report because it may not meet street expectations and/or come with negative guidance. Despite its impressive returns, CC writing is a conservative strategy so in your hypothetical we are adding risk that I am not willing to take. When I post a stock like SNI, it is usually an equity that caught my eye from a source other than the IBD 100 (oftentimes an analyst recommendation or a news item) and want to share with my readers as a possible candidate for our watchlists. Excellent work, you made my day. We’re working on the premium site and when that’s launched, we will complete the Elite ESOC. It will have the ability to calculate position returns at any point in time, including mid-contract, and will have a schedule D for those trading outside of sheltered accounts. There will also be an international version for those trading in countries where a contract is represented by a number other than 100 shares. Congratulations on a job well done. Having read your exit strategies book I understand your point about staying out of options (and usually out of a stock altogether) if an earnings report is due before expiration Friday. Right now there are a number of ERs due at the end of January and into the first week of February for several stocks on the IDB 100 that otherwise might qualify under your system. Do you have a rule (or a guideline) as it relates to purchasing these stocks and writing calls on them after the ER has been released? For example, an ER is due 1/21 for ISRG and one is due 2/9 for CYD. Assuming these stocks meet all other criteria for the system would you buy the stocks and sell February calls right after the ERs are released, or would you skip the February calls altogether and look to sell March calls (either immediately after the ER release or after February expiration Friday)? Thanks. 1- A ER represents the ultimate point in time when the company’s fundamentals can change. We must recheck our screens after the ER to make sure the stock still meets our system criteria. If it does not, we will have kept our cash on the sidelines for nothing. 2- Since we are dealing with 1-month options, the time value of the premium will seriously deteriorate after the first week or two (4 or 5-week contract). Therefore, if a stock will report early in the cycle, I will give strong consideration to waiting for the report to pass especially for a stock that has been a lucrative soldier. Mid-contract or late contract ERs, usually will eliminate that equity from consideration that month….there’s always next month and plenty of other candidates on a quality watchlist. Yes Steve Q. I already reinvested it. I considered the small amount of time value to not be worth it for me to wait until after the weekend to reinvest this cash. Also, with Monday being a holiday it will mean I’m losing a day of time value for the Feb contract. I have a question regarding stocks that go down during the contract period. A perfect example would be MED. The stock went down during week 4 which, makes an exit stratergy unlikely considering it had only had 3 days till expiary. Currently the stock is $27 (I bought it for around $32.50). What would you do in this situation? Would you sell the option right away (at the start of next week)? Would you wait for a few days, perhaps a week in the hope that the stock will go up? Or would you sell the stock? The price bar way below the EMA20. *The MACD had turned negative. *The stochastic had turned negative. If this happens, what is your stratergy? Do you look for the reason why this has happened (news) and if the sell-off has a ‘valid’ reason’, do you then dump the stock…On the other hand, if the reason is ‘nonsense’, do you disregard the technicals and ‘hold on for the ride’? Talk of corporate fraud. True or false? We don’t know but the institutional investors are running for the hills. If no further updates and stock price stays down, I will sell half my position today. In repsonse to Dave’s question I would say that if this news that Gary informed us about, didn’t come to the forefront, I would have considered nurturing this stock back to better health. Corporate fraud, if true, means that all bets are off (remember Enron!). At this point I am only willing to risk half my position. I made the decision to exit the position and redeploy the cash for the new option month. now that there is a law firm involved, I’m not willing to stay around. I’ve been hurt in the past by this sort of thing, i.e. : STEC before. I held STEC because I know the technology and it is important. Also there are rumors that IBM may be a buyer of STEC since they committed to their technology. Sorry for going off topic for this forum. The major difference between these two choices is that CYD still retains a favorable technical chart pattern whereas HITK is weakening. In addition, HITK is down in pre-market. Assuming no major changes during the course of the trading day today, I would normally look to roll out with CYD and allow assignment with HITK. If HITK shows some strength next week, I may re-visit this equity. CYD for Feb 2010 $17.50 strike is only showing 1.45 bid and 1.65 ask – where are you getting STO $2.00 – please advise. as always thank you for your time. Rolling out decisions can be made later in the day (I do mine about 3 PM) especially on a down and volatile day like today. I wanted to share with everybody, on what I woke up to this morning, (West Coast). I had an option get excerised this morning for BUCY. I was going to let it get called away over the weekend, but now I dont have to worry about it. Allan, in your experence have you had a lot options excerised on the day of expiration? This is a rare occurence. Early assignment has happened to me about a dozen times in the last decade. This takes into consideration thousands of contracts. Since we sell American style options it can technically happen at any time from the sale of the option to expiration Friday. A great majority of the time, share assignment will take place after 4 PM on Expiration Friday (when stock price is above the strike sold) and the cash will appear in your account on Saturday or Sunday. Sounds like you did quite well with this one. Any thoughts on precious metal stocks or their ETF’s? Currently I own RAX which is due to release its Earnings report this option period (according to Earnings Whispers). What are your thoughts on this stratergy? Also, what resource do you use for earning report dates? I have noticed that Earnings Whispers and OptionsXpress release different dates. In my view, precious metals at this point in time represent a mixed bag which means we probably can do better in the short run with 1-month calls. For long term investors, it represents a more attractive opportunity. 2- China’s insatiable demand for raw materials continues to present positive long term momentum. 1- Negative price momentum for gold and silver: in the last 4 months this group is up 14%; in the last 6 weeks it has remained the same and in the past week, down 4%. 2- The gold and silver group is in the bottom third as far as NEW institutional money entering. This IS a viable strategy particularly when we have a 5-week contract cycle which we do have for the February contracts. Time value will erode only slightly during this first week so holding onto your stock and waiting to move to a different equity will NOT harm you from an option -premium vantage point. Waiting 5-7 trading days is something I oftentimes do with equities I like. You will notice that on the earningswhispers info, they have a note as to whether the date is confirmed or not. Accuracy is much greater if confirmed. The company itself may not be sure if information will be made public on a specific date if weeks in advance. Another approach (if you have time) would be to go the the company website, get the phone # for “investor relations” and call them. Bottom line: if unsure if the company will report in that contract period….stay away! I have a question calculating yields. I’ve calculated yields for a long time and recently checked my figures against your calculator and am confused. For ITM options you subtract the buydown from the original investment since this reduces the out of pocet expense. I agree but wonder why you also don’t subtract the actual op;tion profit ( total minus the intrinsic) from the original investment since this also reduces out of pocket expense. Anything you can do to reduce the original expense will increse the yield. Also- when calculating the ATM or OTM options you do not subtract the premium from the original investment. Doesn’t this also lower the out of pocket expense? If I don’t reduce my original investment by the premium received, it’s 600/10,000 or 6 %. It’s not much difference, but I keep wondering about it. Thanks for all you do.